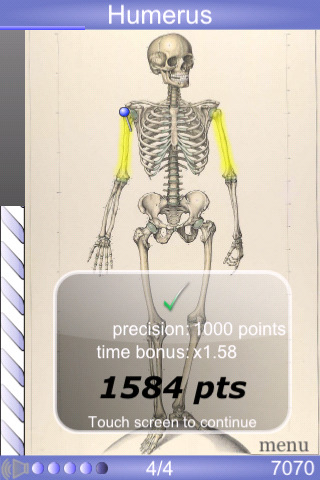 Continuing our series on iPhone and iPod applications for science education (or education in general), the latest app to feature is the excellent Speed Anatomy. 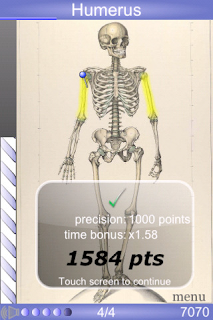 This excellent app allows the user quickly revise the various parts and structures of the body. It assesses how quickly you can find the part named on the top of the page - just point at it with your finger. This is a must for any biology student (in second or third level). There are a number of apps in this series including Speed Bones - if you need to revise the various aspects of the skeleton (possibly a bit advanced for second level). To download Speed Anatomy click here. There is also a free "lite" version available to download here. For any further information visit their website by clicking here. Thanks for these - they are all great! Thanks - another one to come on Friday!